In this edition, most of the commonly occurring minerals of igneous, metamorphic and sedimentary rocks are discussed in terms of structure, chemistry, optical and other physical properties, distinguishing features and paragenesis. Important correlations between these aspects of mineralogy are emphasized wherever possible. The content of each section has been updated where needed in the light of published research over the 21 years between editions. Tables of over 200 chemical analyses and formulae are included and a number of older entries have been replaced by more recent examples. Major new features: Entirely new views of crystal structures in perspective using CrystalMaker colour images; Over 60 colour photographs of minerals in thin sections of rocks under the petrological microscope; Considerably expanded treatment of feldspar and zeolite minerals; Mineral identification table based on birefringence and listing other properties; Colour strip with appropriate interference colours and birefringences for the main rock-forming minerals. This book will be useful to undergraduate students of mineralogy, petrology and geochemistry, especially those at third or fourth year, engaged in more advanced courses or specialized projects, and also as a reference work for students for 'Masters' degrees by taught courses or research. 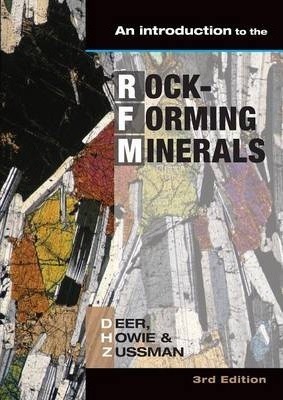 For doctorate students, and research workers in the Earth Sciences as well as those in Materials Science and other related disciplines, this work can be useful as a condensed version of the very extensive treatment presented in the volumes of the DHZ Series 'Rock-Forming Minerals', second edition. Buyers through online retailers should contact the Mineralogical Society in order to receive the free CD which goes with the book (info@minersoc.org).